The Nutri-Tiller strip-till applicator is a one-pass seedbed tool that manages crop residue, enhances soil tilth and improves fertilizer placement for maximum nutrient efficiency and greater return on investment. The Nutri-Tiller lineup manages crop residue, enhances soil tilth and improves fertilizer placement for maximum nutrient efficiency. The new 955 and enhanced 5310 are your one-pass seedbed solutions to effectively manage time, resources and inputs for improved productivity and greater return on investment. Agronomic advantages of conventional tillage with the conservation and cost benefits of no-till. Improve soil tilth by allowing air and water to move freely throughout the soil. Manage crop residue to reduce erosion and maintain soil moisture. Promote soil drying and warming for earlier planting dates and faster germination. Create the ideal planting zone for accurate seed placement and optimal seed-to-soil contact. Place fertilizer directly in the root zone for maximum nutrient uptake and more effective stewardship. Deliver nutrients precisely when and where your growing crop needs them. Case IH is a proud partner of the 4R Nutrient Stewardship. The Nutri-Tiller allows you to apply at the right source, rate, time and place to improve production while minimizing environmental impact. One pass reduces fuel, labor and production costs. Less trips across the field minimizes equipment wear and tear. From the moment the coulter meets that top layer of soil and crop residue until a well-conditioned berm emerges, the objective is to create an ideal environment to get your crop get off to a fast, uniform start. Row unit components work in harmony to create optimal agronomic conditions in a single, high-efficiency pass. Large, 24-inch coulter successfully cuts through tough residue. Independent mounting and a set-screw design lock in depth settings. Down-pressure spring provides reliable penetration for consistent fertilizer placement. Row cleaner effectively moves high levels of residue without gouging or riding above residue. Two adjustable down-pressure spring settings help match row cleaner aggressiveness to field conditions. Ability to float or stow row cleaners above the soil surface for lighter residue levels, such as soybean stubble. High-clearance Shank for Strip-Till (HCS ST) maintains a constant tillable depth for accurate nutrient placement — even in rocky soils. A 1 ¼-inch by 2-inch edge-bent shank, combined with an improved mounting design, ensure the knife and shank stay aligned for pass-to-pass accuracy. Knife adapter shifts the shear point from the knife-mount bolts to the knife adapter, greatly reducing shear bolt or knife breakage. Berm Build’r™ creates uniform berms that are properly shaped and sized, while increasing pore space for improved soil tilth. Die plates mounted to the HCS ST ensure that the disks remain in position relative to the shank, always catching and containing the soil and shaping the berm. Concave, 18-inch notched sealing disks feature holes on the disk face to reduce moist soil buildup. Optional, concave 18-inch unsharpened disks without holes are available for less aggressive tillage. Berm Condition’r™ breaks down and sizes clods, providing a uniform seedbed for optimal germination and uniform emergence. Large, 14-inch rolling baskets catch soil flowing out of the Berm Build’r and keep it within the tilled area. At the same time, rolling baskets smooth berm tops and finalize the seedbed before planting. Best for spring: flat-bar design provides greater clod fracturing and sizing, and helps settle soil for the tighter spring planting window. Durability, adjustability and flexibility each play a critical role in any tillage equipment’s success. When it comes to strip-till implements, expectations are high, and rightfully so — you have one pass to get it right. We designed the frame to help ensure the Nutri-Tiller exceeds expectations. The Nutri-Tiller 955 is available in 8-, 12-, 16-, and 24-row working widths (30-inch row spacing). When in field mode, the toolbar on the 12- and 16-row models flex in three sections — and the 24-row model flexes in five sections — for excellent ground-following. Single-point depth control allows for quick adjustments in changing fields and conditions. Independently adjusted leveling control for inner wing gauge wheels provides simplicity and durability. 24-row unit includes a turnbuckle for front-to-back toolbar leveling. Walking tandems on the mainframe and wings with standard FI tires provide a smooth ride, reduce compaction and keep row units riding at a consistent depth. Optional: New, stubble-resistant VF radial tire option provides a larger footprint for improved floatation and further reduced compaction. VF radial tires offer greater durability in the field and during transport. Steel, welded bridge construction results in a stronger frame. Rounded gussets provide increased toolbar strength. Three ranks of tubing add strength, stability, and flexibility for improved crop residue flow and faster operating speeds. Durable front and rear hitches are aligned for even weight transfer and reduced lateral stress. Constant level rear hitch features a reliable hitch casting, which swings and extends for easier tank hitching. Replaceable poly wear pads on support and contact points ease hitch movement. Larger, heavier hitch casting allows for towing capacity up to 25,000 pounds. Single-fold units: 8-and 12-row models feature two folding sections. Double-fold unit: 16-row model features four folding sections. Triple-fold unit: 24-row model features six folding sections. On 16- and 24-row units, a gravitational lock automatically moves into place and secures the outer wing for worry-free transport. Take the next step toward high-efficiency crop production by pairing the Nutri-Tiller 955 with the Case IH Precision Air 5 series air cart. This option allows you to deep-band dry fertilizer so it’s available precisely when and where your growing crop needs it. With this air package, you can apply up to three products in one pass: two dry fertilizers, plus anhydrous ammonia. Easy-to-fasten, over center latches provide easy coupling and a consistent, secure connection. Dimpled Y-splitters agitate air and product flow, providing a consistent mix for delivery down to the knife. Diffusers above the knife help the product drop freely to the trench floor to provide a consistent fertilizer band at the proper depth. An optional blockage monitor provides feedback via ISOBUS to the AFS Pro 700. Case IH Advanced Farming Systems (AFS) helps you capitalize on all of the advantages and benefits strip-till brings to your farm. From autoguidance that helps keep your strips straight to variable-rate application that helps you achieve fertilizer efficiency to a fully integrated platform that gathers data during every phase of production, AFS is the ideal strip-till companion. Achieve year-to-year repeatable accuracy at sub-inch levels with AFS AccuGuide™ autoguidance. Autoguidance reduces skips and overlaps; saves on fuel and labor costs; better manages your seed, fertilizer and chemical inputs; simplifies operation; and increases productivity. Accurately place fertilizer and other inputs. Reduce overlaps with variable-rate application to help improve efficiency and lower overall costs. Variable-rate applications of up to three products — two granular and one anhydrous — results in fewer trips across the field. View, edit, manage, and analyze your precision farming data in a single suite with AFS software. Generate yield maps, prescription maps and more from a single, integrated software package. Create soil sampling maps, generate and print reports, and import satellite imagery. Securely and easily import and manage all data sources using your AFS software. Get instant access to real-time machine data through AFS Connect™ advanced farm management system. 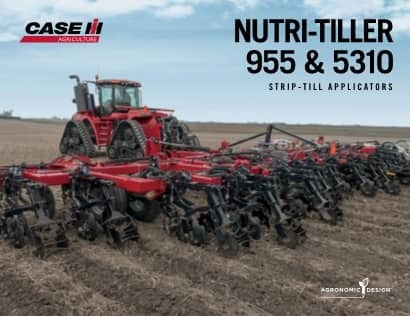 The Nutri-Tiller 955 Strip-Till applicator is a one-pass seedbed solution that helps effectively manage time, resources and inputs for improved productivity and greater return on investment. Visit the Case IH blog to learn more about efficient soil management and other tillage equipment from Case IH. Configure and price your new strip-till system.​ Customize it the way you want.